I’m rather proud of the fact that I haven’t bought any yarn lately (although that will likely change on Saturday), and I haven’t started any new projects – I’ve just been working away on the ones that I’ve got. The Harlot’s launch and party last night was much fun, and Stephanie did a wonderful job of keeping it together for her speech. Funny, sweet and all-around entertaining, she is. 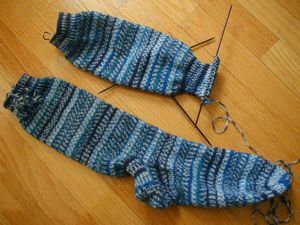 I worked on my blue socks. I actually had to undo a few rows when I got home because I wanted the heel flaps to match. But it’s worth it, right? They’re going at a pretty good clip now. The sleeves of the Phildar jacket are done. I’m still not sure what to do about the fronts. I waver between wanting to do the pattern as written, or changing it. If I do put buttons, they’re going to have to be really light ones – plastic or cork or something like that. At any rate, I’m going to do the back, then decide what to do with the fronts. I might just do them as written, and then if they don’t work out I’ll just rip ’em. 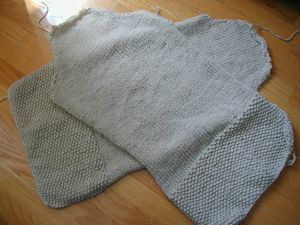 I’m also trying to knit it faster so I can see how much yarn I need, so that maybe I can send the extra back to Elann.